Make a splash with the Mondo promotional USB drive! This surfboard shaped drive is a crowd pleaser that rides the waves to better sales and happier customers. When custom printed in full color, it’s an excellent marketing advantage to be used at trade shows, marketing events, conventions, or retail applications. Great for surf and skate shops, beach retailers, and more! Cruise into better sales with the Mondo. 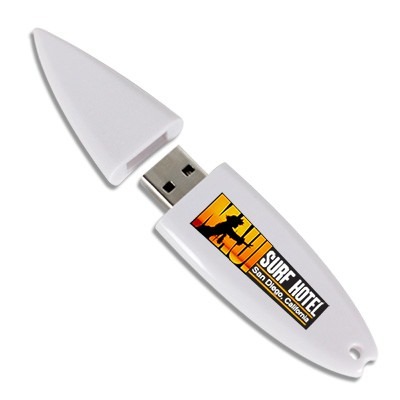 We guarantee you won’t find another promotional goody like this anywhere else. It has lots to offer both aesthetically and functionally. The connector port is tucked away safely in the cap of the surfboard shape and comes in a large variety of capacities. It allows for a large logo or graphic to be silkscreen printed right on the white board, which will set off any logo nicely. It is wearable with an embedded key loop, making transport and access easy. It appeals to a wide variety of demographics and works well with surf and skate shops or beach retailers.